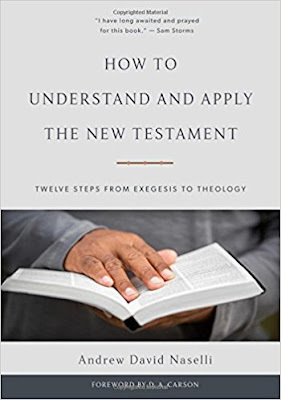 After helping you to walk through the textual portion that you are going to preach from, Naselli offers help with moving through Biblical Theology, Historical Theology, Systematic Theology, and Practical Theology. All of these areas are what will help the expositor to understand and apply the New Testament to his own life and to those who hear him preach. Application is crucial for every preacher because that is where holiness and conformity to the image of Jesus Christ starts being displayed in our lives. Just understanding the nature of the breakdown of the Gospels should help us to understand the priority of preaching what Jesus said and did during this final week of his life. This is just one of the examples of the many nuggets that you will find in his book. Another matter that is extremely helpful is the accompanying Resources for Further Study at the end of each chapter. This section will be a goldmine to the man who determines to dig in even more to the subject that Naselli discusses in his book. While I have been told by some of the older saints that I pastor that I have an “old soul,” I do enjoy some of the modern advancements that we have. One of those is the ability to buy used books on various outlets through the internet. To the frugal and wise expositor, a library that is not just decorative but functional can be had by using this section that Naselli has written about. Increasingly we are coming in contact with those outside the church who are critics of the Bible and whether or not the text is accurate. But even more alarmingly are those within the church who are climbing on board with the critics and are very subtly but effectively removing the trust that saints and ministers have of the Bible. 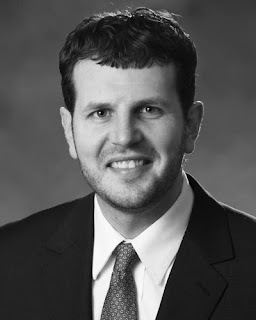 Naselli does a very good job in dealing with the matter of textual criticism and explains that we can be very confident of the accuracy of the current biblical texts that we have available to us. Once again, the section that follows with the resources is very helpful to those who want to track down more books to assist them in understanding the matter in greater depth. While I won’t go through all of the chapters in this blog review, I do want to tell you how useful the chapter on Translations are. There are a lot of sabers rattling in our time about different Bible translations. While I do primarily use the KJV, I am certainly not one of those who fall into the camp of the KJV-Only crowd. In fact, as time as gone by, I am finding that the ESV and NASB have been very, very helpful to me with the flow of the language. More recently, I have picked up the NIV after a long hiatus from it and the NLT as well and benefited from both of them. Since biblical literacy is at an all-time low, I am happy to find that the younger generation of saints are looking for Bibles to read that will help them to grasp the theological concepts necessary for understanding. Naselli spends 31 pages writing on this issue and in my opinion, does a very good job explaining what translations are useful. I would add that if you want people in the church that you serve to read their Bibles, you need to be preaching messages about the power of the Word in their lives and actually encourage Bible reading in your sermons. 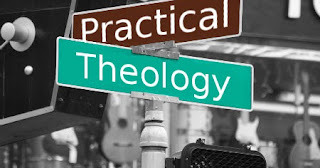 The last chapter on Practical Theology is also a very good one because it causes you to think about what the Bible has to say to our everyday lives. I confess that failingly I have preached before (some time back I hope) the way that Pentecostals preach and ended the message with a loud bang, in fact I have called it “flash bang preaching.” “Flash bang preaching” is loud, exciting, makes a big splash and doesn’t accomplish much. We had a great time but there was absolutely no application to a daily walk in holiness with God and preaching devolved into somewhat of a sanctified pep rally. There was a time that the Lord sharply chastised me for doing that kind of thing to which I repented and have done my very best to get as far away as possible from “flash bang preaching”. The sad part about it is that there is a lot of “flash bang preaching” going on in our day that doesn’t help us to be more holy, more effective in prayer, more productive in advancing the Gospel, it simply has daubed up our emotional hurts until the next Sunday. Practical theology moves us away from the stupidity of preaching to felt needs. It opens us up to the concepts of great doctrines of the Bible, the concept of suffering, the need for perseverance, and the fact that we are in a spiritual war until we are removed by the rapture or we go by way of the grave. 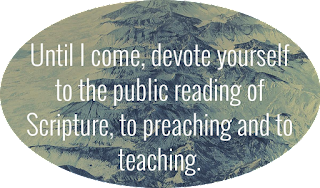 Practical theology in our preaching matters and we have to spend time with Scripture and the Lord to be able to open it up. Practical theology also has an amazing way of sharpening our sense of discernment which is much needed in our day of flaky preaching. I would encourage you to add this book to your library if you are serious about becoming a thoughtful preacher of God’s Word. Great post! We are blessed to have you back! Naselli.. "establishes that all of the Gospels focus in on one week in the life of the Lord." This convicts me, What Jesus done in one week, Lord Help me! I have a lifetime, yet are anable to do what The Lord done in one week. This calls me to repentance...Thank you my brother for sharing your insight.